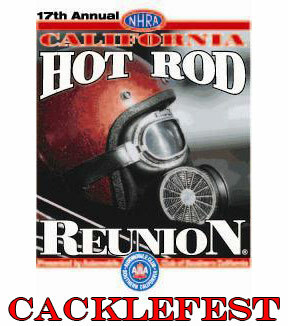 In the last 8 years the CHRR has grown in leaps and bounds and nowhere more than Cacklefest. From 8 cars in 2000 to over 70 in 2008 it has become increasingly difficult to present event coverage that does justice to all concerned. Being the official Cacklefest website we feel an obligation to give the participants and fans more, much more, coverage than any other website delivers. This years coverage took over two weeks to assemble and publish. After poring over thousands of photos from a dozen photographers it was tough deciding which shots to use and then getting them Web ready was a monumental task in itself. After that the story needs to be chronologically laid out and the photos presented in a way that best gives our visitors the best coverage possible. That said and without further ado, the links to our 8 pages (with over 1500 photos) covering the 2008 Cacklefest are below. Before you start your journey keep in mind that the people who really make this possible are those who take the images and to them we owe a great debt - thank you all. Photos by: Bob Brown, Stephen Justice, Steven C. Wallace, Dan Kaplan, Tim Hanaseth, Pam Schavrien, Paul Hutchins, Darrell Conrad, Vic Cooke, Jim Sorenson, Tom Hurley, John Ewald, Pete Gemar, Fred Young and Don Ewald. If you appreciate our CHRR event and Cacklefest coverage (or would like to advertise) please take a second to shoot off an E-mail.